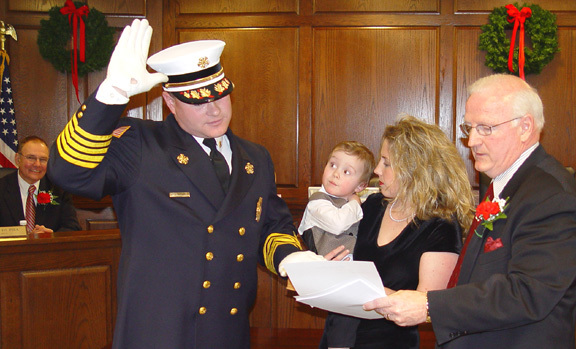 Future Fire Chief Jason with his mom, Colleen, look on as Mayor Ronald R. Jones administers the Fire Chief Oath of Office to Joseph Taylor, Jr.
During the 2005 Reorganization Meeting on January 1, 2005, Joseph Taylor, Jr. was sworn in as the new Fire Chief of the Hasbrouck Heights Fire Department for the first year of his two-year term. The Fire Department also serves the Borough of Teterboro. Chief Taylor will oversee a volunteer department of 54 men and women who operate two engine companies, ladder company, rescue company and ambulance squad. In 2004, the department responded to 500 fire and emergency calls and 1,090 ambulance calls. During a fire emergency, the Fire Department performs many activities simultaneously under the Fire Chiefs command  equipment is deployed, rescue teams search the home/business, hoses are connected, activated and brought in to attack the fire from the inside, ladder companies vent as needed, "F.A.S.T. Teams" are on standby to assist trapped firefighters, EMS is on standby, support personnel are ready (help change air tanks, get tools, etc. ), equipment and personnel from other communities are positioned at the fire house to respond to other emergencies, etc. The ability to mobilize the equipment and personnel in short response time, and to activate these resources in an efficient manner to serve our community during such an emergency, represents hours of training in the department. The Fire Chief's non-emergency duties include: department daily administration (records, purchase orders, budgets, etc. ), personnel, equipment maintenance, on-going department training, etc. The Chief presides over department meetings, organizes drills and conducts the annual inspection of Department members and apparatus. He is involved in pre-planning for emergencies at target buildings such as the Hilton, trussed roof structures and hazards such as the railroad, Teterboro manufacturing facilities and the airport. Along with Captain James Halloran, the Chief works with Teterboro's regional postal facility's management to prepare for a possible anthrax incident. Chief Taylor works with Fire Prevention officials during Fire Safety Week. The Chief coordinates Fire Department operations at special events such as the Easter Egg Hunt, Memorial Day and Chamber Holiday Parades, Memorial weekend 24-hour bicycle marathon, Rau-Fitzgerald Memorial 5k Run/one mile walk, Mason's 5k Walk for Dyslexic Children, Town Day and the Department's annual Santa Ride Around Town. The Chief represents the Fire Department at the Mayor and Council meetings, and with other borough officials. He also represents the Hasbrouck Heights Fire Department at mutual aid official functions in other communities. Chief Taylor's plans for his term include: first and foremost to protect life and property and to make sure no one gets hurt and that everyone is safe. Second is to square away the new fire house, and third is to consolidate the three fire companies into one department so that there are one set of administrative rules. He stated, "As we settle into our new fire house, my goal this year is to make the Fire Department more efficient, with accountability and better response time to serve the communities of Hasbrouck Heights and Teterboro." Taylor's career began in 1986 when, as a senior in Hasbrouck Heights High School and walking home after school along The Boulevard, he watched a Hamilton Avenue house fire. Two weeks later he joined the Department. He started as a probationary fireman and over ten years trained in Firefighter One, Two and Three courses. Firefighter One and Two pertain to basic and intermediate fire fighting, and Three to Tactics. He has formal training as an EMT, HAZMAT technician and a heavy rescue technician. In 1996 he started as an EMT for the City of Hackensack (emergency services) and previously was an EMT with Ambu-Aide in Hasbrouck Heights (non-emergency transport services). Fire Chiefs work their way up the chain of command. As a member of Engine Company #1, Taylor was elected by the company for the position of 2nd Assistant Chief. Two years later the Department members elected him as 1st Assistant Chief and then as Fire Chief. Fire Chiefs generally serve two-year terms. Taylor was born in Hackensack Hospital and spent his childhood in Hasbrouck Heights. Two of his grandparents and dad also grew up in Hasbrouck Heights. Taylor is married to the former Colleen Kelley and has a three year old son, Jason. He and his family live in Hasbrouck Heights on Hasbrouck Avenue.